For the first time, Burning Nights CRPS Support charity is getting involved in UK Charity Week 2018 by becoming an Official Partner Charity! 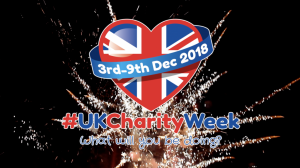 UK Charity Week is a time for UK charities to get involved for one week of the year and is supported by Charity Today and For Good Causes. 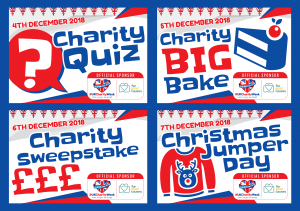 UK Charity Week 2018 starts on Monday 3rd December 2018 and there will be events, fundraisers, social media posts throughout the week and will end on Sunday 9th December 2018. 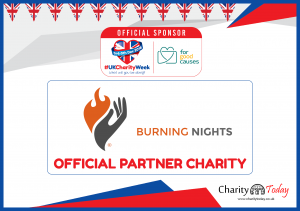 Why not get involved this week and hold your own fundraiser in aid of Burning Nights CRPS Support charity? Or why not sign up for one of our many ways to donate without actually donating a penny of your own? Check out our Other Ways To Donate page for more information! You can always donate £5 by text message if you would prefer? Learn more about Text Giving to Burning Nights CRPS Support on our Text To Donate page or just text ORANGE to 70500 to donate £5 plus the cost of a text message as a one off donation.